We look forward to seeing you all this coming Monday, at the Parent Partnership event on November 26. Your children will present their work to you - a wonderful opportunity to see what they spend their time doing here. Dinner will be served at 5:30, and childcare and the program are 6-7pm. This event is for all families in the school and we encourage you to make use of the childcare so that the child you are with has your full attention. Upper Elementary families are encouraged to stay after the Parent Partnership for a conversation with alumni from 7 to 8pm; child care for younger siblings will be available. Please RSVP to Zitlali (reception@mtcm.org) as soon as possible for both events. Our next Cornerstone Cafe will be December 7 at 8:30am. We will be joined by Amber Osterkamp, lead guide in Pond. A reminder of this event, along with other important dates in December, will be sent home with your child at the end of next week. I wanted to share two resources that are available to families, as you spend time with your children this weekend. www.montessoriguide.org has videos and articles on a variety of topics relating to Montessori and child development. It is a wonderful place to explore if you have questions about your child and ways to support him/her at home. Cornerstone also has a lending library of books and videos available for your use. We encourage you to come in and look at what is available. 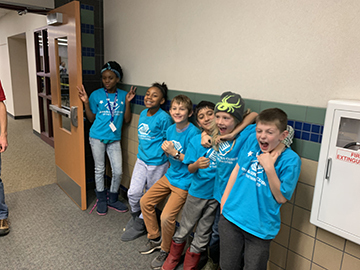 A fun note to conclude this short week: several of our Upper Elementary children competed in a Lego robotics competition through the Boys and Girls Club!